First, here is a photo from our dinner tonight. We are hotel living for the week and have a very small fridge and zero other provided appliances (not even a microwave). 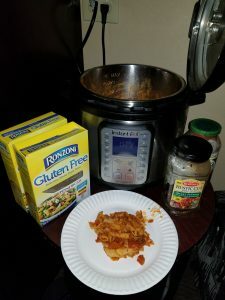 Of course I brought my Instant Pot and we have used it 2 of the 3 nights so far! Tonight, spaghetti (last night baked potatoes). I didn’t prep a single thing and it was so simple. I know all my sports tournament moms can relate! Anyway, here are my favorite Instant Pot options. The 6qt Instant Pot Duo is the same size and style I use for my family of 5. For a larger family or if you are a freezer meal Momma, you may want to consider the 8qt Instant Pot. I know a lot of IP lovers that are getting this cute little mini 3qt for veggies and side dishes. These appliances are like chips, you just can’t get enough! I strongly encourage you to get a Duo because it has both high and low pressure settings as opposed to the Lux. Also, if you are debating on which size you want for your main pot than I would suggest going bigger. While I do have a 6qt for my family of five and it works well, I have occasionally wished that I had a larger one so that I could cook for two meals at once. If you have any questions about the Instant Pot or would like to receive some recipes when I get them all in presentable form, please comment and I’d be happy to help! How to Winterize your RV/Camper Easily!